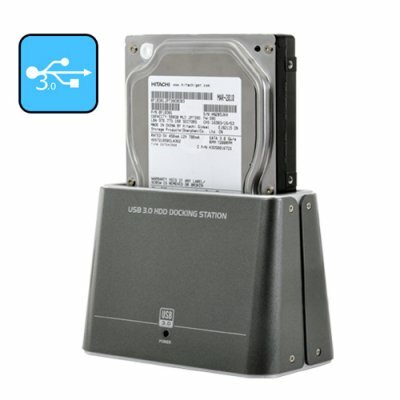 Successfully Added HDD Docking Station - USB 3.0 to your Shopping Cart. USB 3.0 hard drive docking station for super speed data transfers. This is the next generation data transfer super speed that will provide you with a faster and more reliable transfer of data from your computer onto your docking station. This USB 3.0 HDD docking station supports speeds up to 5gb/s which enables you to transfer/read/write tons of digital contents such as Videos, Music, intense docs like PSD's, and more in record time from your computer onto your HDD. If you are still using USB 2.0, then there is no need to worry. This USB 3.0 Docking station still maintains backwards compatibility with current USB 2.0 devices and will still provide you with faster transfer speed unlike regular USB cables. No longer do you have to wait endless minutes for your files to be copied or moved on to your external hard disk. By using this USB 3.0 docking station you save time and hassle. This superb super fast USB 3.0 HDD docking station is in stock now and available at a factory direct wholesale price directly from, Chinavasion. Click "Add to Cart" now, and in a few days you'll have your very own USB 3.0 Docking Station. My PC only has a USB 2.0 Port, what will the data transfer speed be if I am using a USB 2.0 port? When transferring your files using this USB 3.0 cable to the HDD docking station, average speed using the 2.0 USB port on your PC will be around 50MB/s. Note: Current hard disks do not exceed the 3.0GB/s transfer rate, but the USB 3.0 cable can support up to 5GB/s. This way, the USB 3.0 Cable will allow maximum transfer rate of 3.0GB/s when using a USB 3.0 Port on your PC. What could hinder achieving the maximum transfer rate when transferring files from my computer onto the HDD docking station? When transferring data from your computer to the HDD docking station using the USB 3.0 cable, background running application and your processor could reduce the transfer speed, but you will still be able to enjoy fast transfer rate, unlike when using a regular USB cable.